Automated steering capabilities are coming soon to commercial vehicles, suppliers of truck steering systems said. Bud Miller, vice president of sales and marketing at R.H. Sheppard Co., said truck steering has become much more car-like during the past 10 to 15 years. The next step, he said, is to make steering more intelligent as truck manufacturers move toward autonomous driving capabilities. It’s very likely that vehicles with “Level 2” automation, in which driver-assist systems help automate acceleration, deceleration and steering, will appear soon, Miller said. In trucking’s case, adaptive cruise control provides the acceleration and deceleration to maintain speed and following distance while automated steering coupled with camera and radar sensors could provide the lateral control for automated lane keeping. Separately, Wabco Holdings in August said it agreed to acquire R.H. Sheppard for its active steering capabilities. The $145 million transaction is expected to close by the end of the third quarter. Automated steering also is a priority at ZF Group, said Kent Jones, global director of sales and business development at the company. 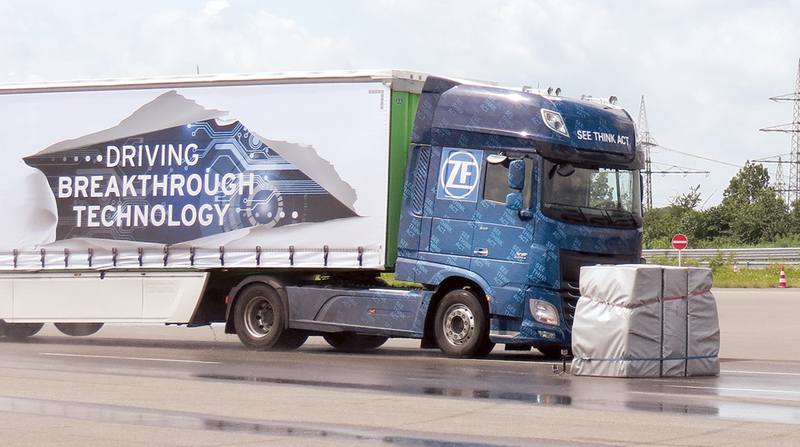 Last year, ZF rolled out its Innovation Truck concept at a test track in Germany. The vehicle demonstrated “evasive maneuver assist,” an automated accident avoidance technology that incorporates active steering to help the driver avoid a rear impact with a stationary object when the truck fails to decelerate quickly enough through braking alone in slippery conditions. This was enabled by the electric-motor assisted ReAX hydraulic steering system developed by TRW, which is now part of ZF. Those capabilities will be essential for autonomous and semi-autonomous vehicles, he said.